Why Are Bankers Boxes So Expensive? Bankers boxes are very easy to assemble. There is no glue involved with the set up process, which can attract bugs or other furry creatures. Simply fold the box into a square and voila! A bankers box is typically 12 x 10 x 15, with a stacking weight of over 400 lbs. Each box comes with a lid so you do not have to worry about how to cover the box, making it a sturdy foundation for more boxes. The heavy duty frame of a bankers box makes it easy to stack boxes on top of each other. Stackable boxes makes file storage much more convenient and a space saver. Bankers boxes are made out of a very thick cardboard, making some people wonder if they are harmful for the environment. However, Bankers Boxes are typically made of at least 65% recycled products. This video from Offsite Data Depot shows the importance of the durability of your storage boxes. 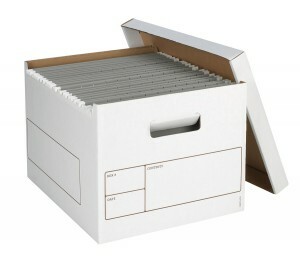 Another option when considering investing in bankers boxes is to hire an offsite record storage company. By hiring a service provider, you do not have to worry about where to physically store the boxes or purchasing them. The offsite provider will bring you the number of boxes you need and take them to their location to store. If you are looking for an offsite record storage solution we can help. We have record storage experts that can help you maintain your records storage needs regardless of format. 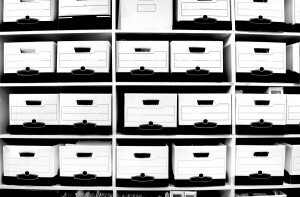 We can help you manage your hard-copy records, and even guide you through the transition to offsite storage. We offer you free quotes from local storage providers in your area. Simply fill out the form to the right, or give us a call at (866) 385-3706 for a free quote today!